I am interested in understanding the mechanisms of disease so that more appropriate approaches to treatment can be developed to improve outcomes. I have been interested for many years in molecular aspects of bowel and breast cancer. By studying the molecular basis of these diseases it has served as a springboard to study other diseases such as melanoma, ovarian cancer and multiple sclerosis, schizophrenia. Indeed the skills I acquired as a geneticist are transferable to a variety of other diseases. When I first started my research career in the 1980s, I realised very early on that this was a profession that was always going to change and would not become mundane. This was the sort of career I relished because the last thing I wanted was a career that was repetitive. I used to discuss with my father how he treated his patients for their diseases and I realised that I wanted to do more than that. As a medical researcher, I concluded that I could make a more profound difference to people’s health by understanding the genetic basis of disease. What is the ultimate goal for your research? Ultimately, I want to alleviate needless suffering. I hope that we can develop the ability to intervene at an appropriate time in someone’s life to reduce the risk of succumbing to a disease before they should. We all grow old and I want to see people living a long fulfilling life that is healthy from beginning to end. Laureate Professor Rodney Scott is an internationally recognised leader in genetics who has been instrumental in bringing the Hunter to the forefront of personalised medicine. Professor Scott has been involved with HMRI since it was established in 1998. His first appointment in the Hunter was as Professor and Head of the Discipline of Medical Genetics at the University of Newcastle and as Director of Molecular Medicine in the Hunter Area Pathology Service, positions he still holds. His research focuses on the identification of genes associated with inherited forms of colorectal cancer and breast cancer. 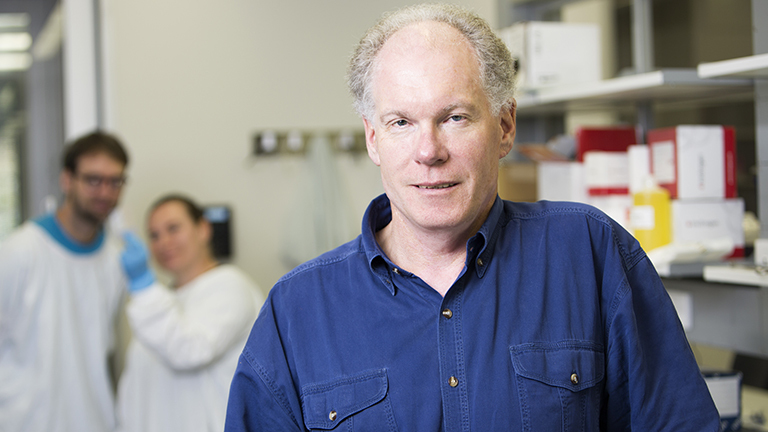 In 2005 Professor Scott was appointed the inaugural HMRI NBN Telethon Chair of Childhood Cancer in recognition of his outstanding research track record in genetic predispositions to cancer. The work involved looking at the genetics of leukaemia and brain tumours in children which is ongoing. Professor Scott is involved with the Hunter New England Health Family Cancer Genetic Counselling Service and first initiated testing for familial breast and familial colon cancer in the Hunter New England Region to ensure early risk detection for patients and their families that could lead to preventative strategies and better. Recently, Professor Scott found a new suite of genetic biomarkers that are associated with the “triple negative breast cancer", a subtype of breast cancer that lacks the three critical receptors and is difficult to treat since none of the newer therapies target this type of breast disease. In women with this type of cancer, the well-known BRCA1 and BRCA2 genes were found to be present in up to 10% of patients. Professor Scott’s work has led to collaborations with other HMRI Research Programs and collaborators across the globe, now having more than 500 peer reviewed scientific publications in genetics research spanning the fields of cancer, asthma, stroke, schizophrenia, multiple sclerosis, macular degeneration, lung disease and sudden infant death syndrome (SIDS). He has attracted over $45 million in grant funding over the course of his career. Professor Scott currently leads a program of over 30 research staff and is supervising over 20 post-graduate students working on multiple aspects of genetic research. More details at Professor Scott’s University of Newcastle research profile. This project aims to confirm or refute the predicted targets of the deregulated miRNA and determine the functional impact this has on cellular behaviour in the MS brain. This project comprises the analysis of DNA samples obtained within the NHRMC funded 5-year longitudinal study of mental health among rural community residents. The thyroid gland is responsible for the secretion of hormones involved in growth, sleep patterns, and cognitive development. Stroke is the leading cause of long-term disability in Australia and the second leading cause of death. The development of microarray technology of biomedical research in the Hunter Region.